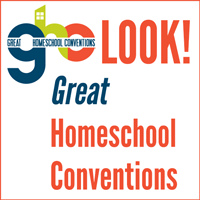 We are excited to be participating with the Great Homeschool Giveaways Monthly: November Edition! Welcome to the November Edition of Great Homeschool Giveaways Monthly! 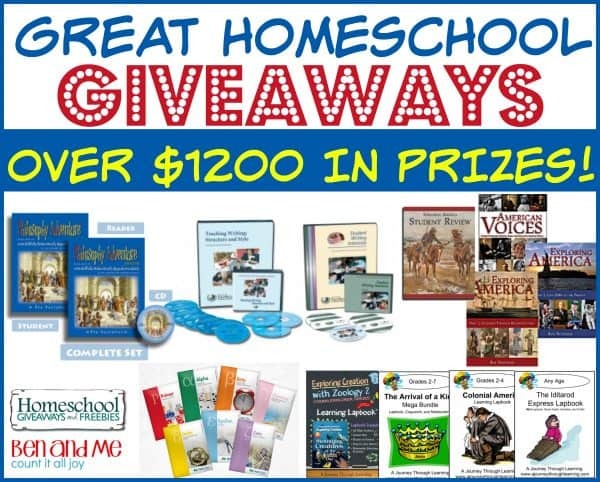 Each month, Homeschool Giveaways and Ben and Me, along with a host of homeschool blogging friends, are bringing the homeschool community GREAT GIVEAWAYS and FREEBIES! Here’s how it works: There will be 5 INDIVIDUAL WINNERS (one from each sponsor) and . . . One GRAND PRIZE WINNER, who will be awarded every prize in the giveaway, a value of up to $650. Many of the sponsors are also providing GREAT FREEBIES for everyone! This month our generous sponsors include Notgrass, Home School Adventure Co., Math-U-See, IEW, and A Journey Through Learning. Exploring America is an American history high school curriculum combining American history, American literature, and Bible. It will give your high school student a rich understanding of our nation’s past as he reads the history narrative, reads classic American literature, completes writing assignments, and studies what the Bible says about issues and ideas in American history. 2014 Edition. Laura’s Little Houses is an ebook that provides information on twelve sites related to Almanzo and Laura Ingalls Wilder and their families. Get a free copy when you subscribe to the Notgrass e-mail newsletter. DO YOU NEED to teach advanced writing and speaking skills? DO YOU WANT your students equipped to discern truth as ungodly messages bombard them? DO YOU WONDER how to cover all they need academically as well as practically? Philosophy Adventure may be your solution! Philosophy Adventure™ is designed to help students 6th-12th grade cultivate and defend a biblical worldview by teaching them how to write skillfully, think critically, and speak articulately as they explore the history of ideas. Writing can be hard work. Good writing most often results from much rewriting, and much rewriting can make a writer weary. Since Philosophy Adventure™ students polish one primary writing assignment over the course of several weeks (supported by clear step-by-step instructions and seven writing checklists), we created Creative Freewriting Adventure to offset their hard work with play. We quickly discovered that even students who considered themselves “non-writers” produced surprisingly creative work using these exercises. (Some parents even joined in the fun!) No prep required. Just grab a pen and paper, set a timer, and have fun! Math-U-See, Demme Learning’s flagship product, has been reaching students for over 20 years with its unique integration of manipulatives and instruction that is focused on concept mastery. The winners will be contacted by Math-U-See after the giveaway to place them in the appropriate level. Math-U-See is partnering with KinderTown, the educational app store for engaged parents, to give you a list of apps that KinderTown recommends for homeschoolers. Download the free KinderTown app on your iOS device to find the best educational apps for your children. In this value package, we offer two of our core programs: Teaching Writing: Structure and Style and Student Writing Intensive (A, B, or C). Teaching Writing: Structure and Style walks you, the teacher/parent, through all the methods and techniques of our program, equipping you with the knowledge you need to successfully coach your grades 2–12 students in the IEW writing program. Student Writing Intensive (A, B, or C) is a 15- to 30-week DVD course wherein Andrew introduces IEW methods and techniques to your students. Each level is geared towards a different age group (A 3–5, B 6–8, C 9–12) and assumes no previous IEW experience, which enables your students to jump right in no matter what their grade. It’s never too late to learn to write well! A Journey Through Learning Giveaway – $75 total value! Our Swimming Creatures lapbook has one full folder of beautiful mini-booklets for EACH chapter in Mrs. Fulbright’s book. It is very thorough and meaty and covers much of what Mrs. Fulbright’s book covers. It even has a built-in lesson plan that tells you the pages to read each day. Learn about the events and the people surrounding the birth of Jesus. Your child will learn about Joseph, Mary, Caesar Augustus, Gabriel, Zachariah, Elizabeth, John the Baptist, Shepherds, Herod, Sheep, The Romans, The Wisemen, Gold, Frankincense, and Myrrh and more! This lapbook is a very light study of American colonization up to the Revolutionary War. Suitable for lower elementary. The Iditarod Trail Sled Dog Race is an annual long-distance sled dog race run in early March from Anchorage to Nome. Mushers and a team of 16 dogs cover the distance in 9–15 days or more. Teams frequently race through blizzards causing whiteout conditions, sub-zero temperatures and gale-force winds which can cause the wind chill to reach −100 °F. Your child will copy famous speeches, quotes, historical documents and newsworthy happenings while at the same time reinforcing spelling, grammar, and punctuation skills. To enter, use the Rafflecopter below. Giveaway ends November 19 at 11:59 PM ET. Terms and Conditions: This giveaway is open to U.S. residents only. Void where prohibited by law. Must be at least 18 years of age. This giveaway is in no way associated with Twitter, Instagram, or Pinterest. No purchase necessary for entry. Odds are determined by the number of entries. Selected winners will have 48 hours to respond to email notification to claim their prizes or another winner will be drawn. Entry into this giveaway will subscribe you to the Homeschool Giveaways and Ben and Me email lists. HUGE Homeschool Curriculum Giveaway — 6 Winners! Another HUGE Homeschool Giveaway — 6 winners! IEW would be my favorite, I keep my eye on it all the time, but just don’t have the room in my budget. I would most like to win the IEW kit. The IEW materials would be a huge gift to win! I would love the IEW package…have been looking at this program for a long time. IEW, but math u see is a close second! Math U See level is needed now! The rest would be neat as well. The Notgrass History and a Journey Through Learning are my top picks! What a great giveaway! Thank you so much! I always love when you guys get together and do these mega giveaways! Hope we win! Any of them would be great! I’m new to homeschooling & didn’t get to start until my daughter is 16. Because of medical bills we just can’t afford anything really so we are begging & borrowing for everything we can get. Thanks so much!